Blue Haven Resort, Turks and Caicos. 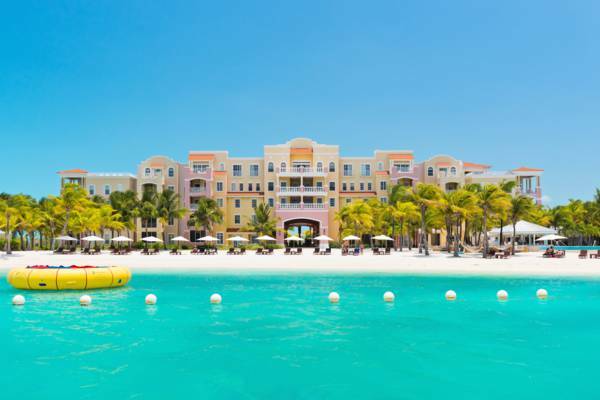 The beach at the luxury Blue Haven Resort on Providenciales. Blue Haven Resort is a luxury resort with 35 suites and 16 studios located in the private Leeward community on a private beach. It’s here where guests can escape to peaceful relaxation, yet is also the ideal vacation destination for outdoor adventure enthusiasts. With the adjacent Blue Haven Marina, the world’s 3rd largest barrier reef is only minutes away for spectacular diving and snorkeling. The mangrove islands opposite the resort are exciting to explore by kayak or stand-up paddleboard, and sport fishing, jet ski and sunset cruises depart from the resort so you can maximize your enjoyment on the water. Blue Haven Resort has three bars and two restaurants as well as a Market café and grocery store, a spa, fitness room, kids club, bicycles to explore the area, plenty of beach games such as volleyball, horseshoes, chess and beach tennis, water trampoline, and of course, Blue Haven’s beach is covered in palm trees with several hammocks to laze the day away. The Fire Lounge on a waterfront pier is yet another relaxing spot to find yourself in. However you choose to enjoy your vacation, Blue Haven Resort and its friendly staff will ensure you have a fantastic time.